We're proud to provide Drupal services. Reimagined on Drupal 8, in six sprints. A testimony to Drupal 8 and the efficacy of the agile approach. 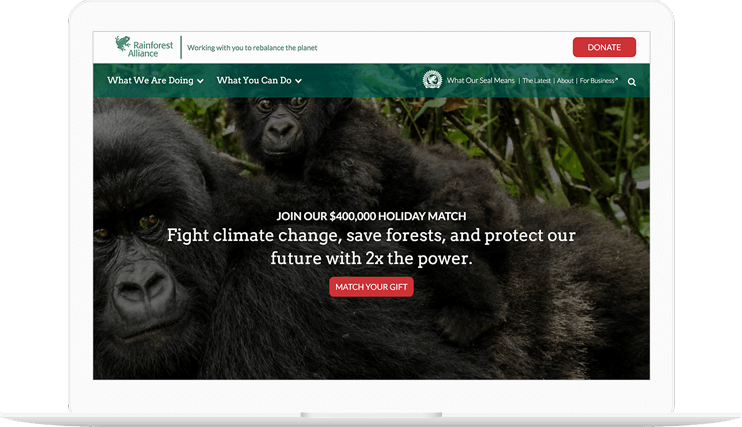 In the fall of 2016, the Rainforest Alliance and Last Call Media launched an exciting redesign of www.rainforest-alliance.org, built on Drupal 8, employing seasoned agile software development methodologies. Our productive partnership with the Rainforest Alliance resulted in a technically groundbreaking site that allowed users unprecedented access to the riches of their content after just four months of development. The tool is now primed to drive the Rainforest Alliance’s critical end-of-year development activities. People seem really, really happy with it. YAY!! Over the years, RA has cultivated a repository of structured content to support their mission. While the content is primarily displayed as long form text, there is a wide variety of metadata and assets associated with each piece of content. One of the primary goals of the new site was to enable discovery of new content on the site through automatic selection of related content driven by the metadata of the content the user was viewing. Additionally, RA had a future requirement for advanced permissioning and publishing workflows to enable stakeholders outside of the web team to play a role in the content lifecycle. Drupal 8 was selected for this project based on several factors. First, its focus on structured data fit well with Rainforest Alliance’s need for portable and searchable content. Second, the deep integrations with Apache Solr allowed for a nuanced content relation engine. Solr was also used to power the various search interfaces. Third, Drupal has historically had powerful workflow tools for managing content. While these tools weren’t quite ready for Drupal 8 when we built it, we knew they would be simple to integrate when they were ready. In short, Drupal was a perfect fit for the immediate needs, and Drupal 8 met the organization’s longer term goals. We’ve been getting lots or praise, internally and externally. Brava, team! At the close of Sprint 6, there were zero critical and only 3 moderate issues to address. The final Sprint/Project review had only 3 support questions, launching as arguably the most impressive Drupal 8 site launched within a year of the initial release of this latest major version on the Open Source CMS, and most importantly, in time for Rainforest Alliance’s major end-of-year donation campaign. The site delivers on its promise to showcase the Rainforest Alliance’s exciting and informative messages and beautiful imagery, and stands as testimony for the efficacy of the agile approach. Purchasing workflow and subscription management. Automating high-volume customer request processing with AngularJS. Success meant they needed new automation for their process. Unable to keep up with manually processing a high volume of new and existing B2B customer requests, DEEP Information Sciences (DeepIS) asked Last Call Media to build an online self-service subscription management service on top of their Drupal 7 site. The service needed to enable customers to create an account, provide necessary marketing metadata for DeepIS’ marketing team, and guide customers through the sales process from subscription estimation to subscription purchase, renewal, and upgrade. Customers also needed to access content related to their service, DeepSQL, online in real time. Leveraging AngularJS, LCM built a seamless custom subscription purchasing workflow app to guide the user through the dynamic purchasing workflow by feeding and pulling data as necessary to and from HubSpot, their marketing automation tool; SalesForce, their CRM; and Zuora, their subscription management service. The custom subscription calculator in the AngularJS app pulled in data in real time from Zuora, using Zuora’s APIs, so users were presented with the most up-to-date pricing. Once the purchasing workflow was complete, the user’s card was charged and they received an email with their receipt and license key moments later, all without needing to speak to a DeepIS representative. This implementation solved the problem where a prospective customer had to email or call DeepIS to purchase a subscription and manage their account. The new online workflow slashed the conversion time by eliminating the need to call DeepIS to purchase a subscription, increased customer satisfaction, and significantly increased revenue for DeepIS. With the biggest barrier to conversion eliminated, users were now clicks away from purchasing a subscription. Further, with event-triggered email campaigns using HubSpot, DeepIS was able to strategically nurture customers on the trial or free plan to upgrade to a paid plan. Data from SalesForce, Drupal, and Zuora was fed to HubSpot email campaigns, increasing the likelihood of a user purchasing a paid subscription. The emails had a unique URL generated by SalesForce, and the user could provide their credit card information and upgrade their subscription with a few clicks. Comprehensive involvement from start to finish. 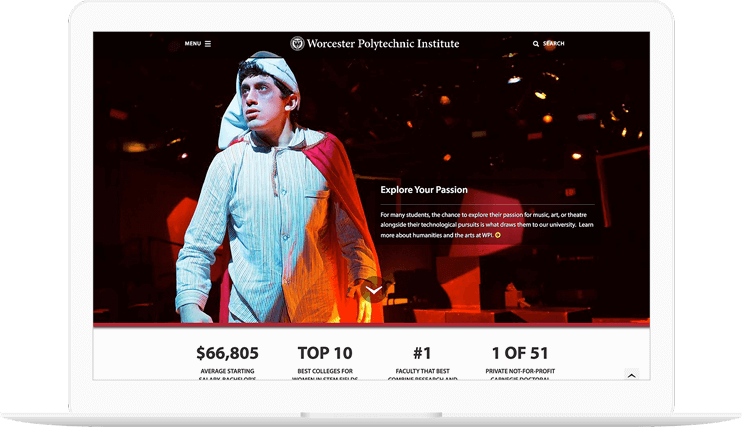 Clinically speaking, our recent work with Worcester Polytechnic Institute is a testimony to Last Call Media’s approach to the initial project phases of Discovery, Strategy, and Information Architecture. That said, the most important part of this story is how our flexible and adaptable work process embraced by both the WPI and Last Call Media teams resulted in a process and a final outcome that meets WPI’s stakeholder needs. Strong partnership-building was the goal from the outset, and it paid off in strong relationships and expectations satisfied. Thanks to WPI’s commitment to collaboration, the redesign of wpi.edu represents one of Last Call Media’s most comprehensive involvements from start to finish of any project to date. We acted as more than designers and developers, but instead as all-encompassing strategic management consultants, working with WPI to organize multiple stakeholders toward the realization of stated and unstated goals. The project had humble beginnings. WPI had a lot of ideas, which they’d translated into a giant content model spreadsheet. We meticulously ensured that we understood it all, guiding a wireframe process in which we were able to make significant contribution to the decision-making that yielded a highly intuitive structure. We took each step iteratively, building piece-by-piece, soliciting feedback, and then building the next iteration. We facilitated a dialogue between administrators, college communications, their design department, their IT department, and Acquia to map the landscape of business requirements, organizational needs, and their desired design aesthetic. On the technical side, we reviewed their existing RedDot site, and built a ‘scraper’ to scrape select content out of it and import the data into its new structure in Drupal. We open-sourced the scraper, too. Next, we built a flexible layout system of building blocks that enabled them to build pages however they needed. We dubbed them “widgets,” and WPI called them “elements,” but they were central to satisfying their desire for incredible flexibility that allowed them to build unique layouts on any given page. As part of the creative partnership, Last Call Media’s creative team worked closely with WPI to improve the look and utility of the Events Pages, the Calendar, and a database of accolades they maintain. The outcome was a set of tools that present information in simple and digestible ways. WPI’s communications team helped LCM fully understand their brand, which enabled us to showcase their identity as we applied it to the work product. Every step of the way as we constructed functionality, WPI developers, content authors, and staff gave feedback on the project as fidelity increased from a rough, unthemed Drupal site, to a polished release candidate. At the same time, Last Call Media was enabling WPI Developers to be self-sufficient in Drupal so they could help build new functionality. Last Call Media also built a custom ‘faculty importer’ that synced data from their Ellucian Banner system into Drupal, greatly simplifying the construction and accuracy of faculty pages. Because we were in constant contact, there were never any ‘big reveals’ for WPI leadership to react to that represented hours of work they had to wrestle with approving or sending us back to the drawing board - they’d been part of the process at two week intervals and on board with each decision as it was made. Today, the ability of the various administrative and academic departments at WPI to use the site is unparalleled in Last Call Media’s experience. The partnership enabled WPI’s content developers, in-house communications staff, designers, and developers to fully leverage the new wpi.edu. As a result, we’re seeing profound stakeholder use of the tools we collectively built. WPI embraces our approach and recognizes the value in the systems our working partnership designed. Such engagement is the dream of every project, and we’re proud it’s being realized at Worcester Polytechnic Institute. We continue an ongoing relationship with WPI providing support and strategic counsel as necessary. What can Last Call Media do for you? Delivering a high stakes MVP. Getting agile right by launching early, often, with high value. Following a branding initiative, Designow worked with Last Call Media to build and launch the initial release of a complex crowdfunding platform on Drupal. When we began, initial prototyping and feature development had already been started. As is often the case, much of the prototyping had made its way into substantial portions of what was now the project’s foundational work. It had become difficult to determine exactly what was completely done, what was partially done, and what requirements had been left out along the way. We used our expertise in Agile methodologies to bring order to complexity and the product to launch. We began by building and prioritizing a backlog of tasks, and getting high-priority tasks into a ready state by defining appropriate definitions of done. We focused on implementing strategies for limiting the work in progress present in the project when we started. We forecasted a few sprint goals, informed by our backlog development and resulting strategies, and quickly went into heavy development. Immediate visibility for stakeholders into development progress became of major importance for their own ability to make quick business decisions concerning their investment. In order to maximize the value of the work, we adapted our initial Scrum iteration approach into shorter, one-week sprints of continuous delivery to get small groups of completed tasks out faster. This soon evolved into more of an ideal Kanban flow, allowing a continuous awareness and continuous delivery of the right value. Since the initial release, LCM and Designow have continuously measured and inspected valuable feedback. Our work is ongoing, as the product is currently receiving regular releases of new features and refinements. Drilling down to an education. Faceted searching areas of study. Education sites are huge and contain a lot of information. There are many different personas who frequent these sites, and they’re all looking for a wide variety of resources. After getting the right personas to the right area of the site, faceted searching was one of the solutions Last Call Media implemented to help visitors drill down further into the specifics. In this case, it was WPI’s areas of study. We developed a faceted search tool for their degree and certificates catalog to solve the challenge of drilling down through the options to get to a specific area of study. By structuring and categorizing the information of this catalog appropriately in the database, we were able to implement faceted searching functionality for the areas of study across Bachelor, Minor, Certificate, Master, and PhD programs. Site visitors are able to use this implementation to drill down to very specific information, so this work has substantially increased engagement, as well as conversions. Five College resources from the Title IX team. 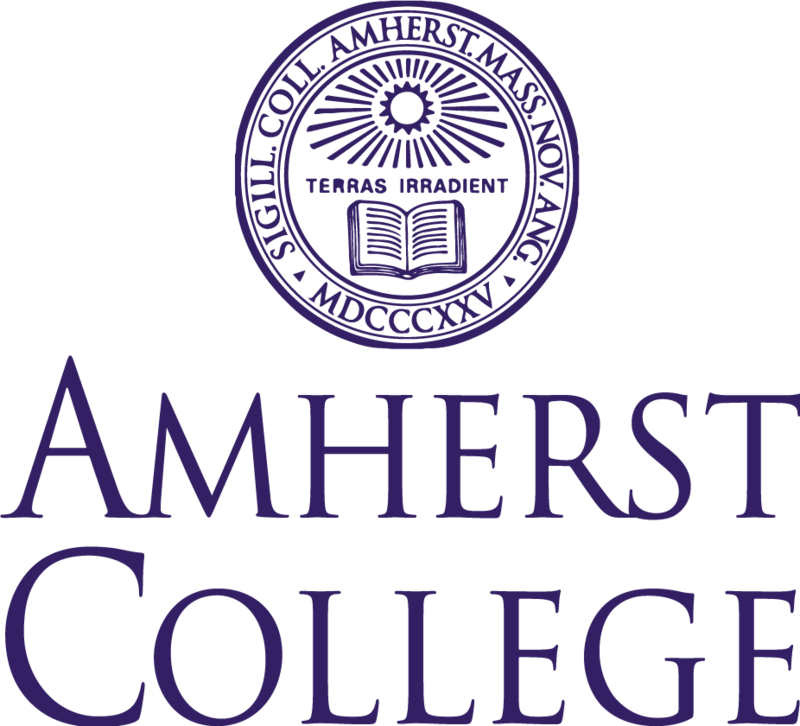 In response to growing concerns and attention around Sexual Harassment and Assault Nationwide, Amherst College needed a tool to serve students of the Five Colleges with rapid access to Title IX office information and emergency services. 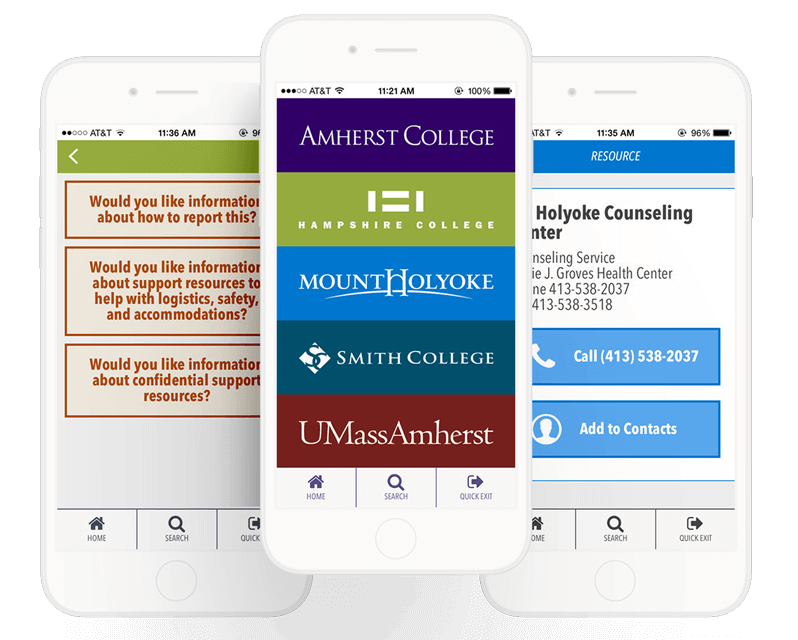 LCM and Amherst College worked together with student advocates, Title IX, LGBTQ, and other campus offices and organizations to design and develop an iOS App that puts valuable information, from a Drupal site Amherst can administer, into the hands of students. The major feature of the app was to direct assault survivors to emergency contact information, help services, and other advocacy groups, anonymously and quickly. The app was announced to all incoming and returning students during new school year orientation. Information about the app has been circulated through the Five Colleges on promotional materials and “get help” brochures and posters. When LCM got the call from Haverford about redoing their site in Drupal, we thought it was going to be a redesign. After an initial conversation we agreed to do a Discovery and Strategy engagement first, to determine what the true needs were and then develop a strategy for solutions. We conducted stakeholder interviews and developed the User Personas of who our work was to be for. Interestingly, none of these personas ended up being an anonymous site visitor, but instead were different types of content editors and administrators. 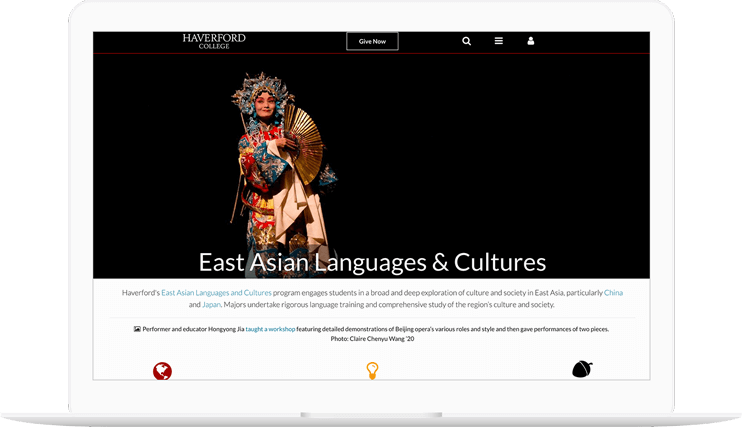 Haverford didn’t need a redesign; their site looked great already. The biggest issue they needed to solve was not having enough time to do new feature development themselves. They were a smart and capable team and over many years had developed and maintained a large custom PHP implementation for college’s website needs. They were finding, however, that too much of their time was being spent updating pages for college members and groups. Their hope was for us to build them a site that looked and functioned like their current site, but built on a modern CMS with exceptional user management and publishing workflows. Once we had alignment on their needs and a strategy for solutions, we built out a Content Model, Product Backlog, and Information Architecture. The project was completed with Drupal in steady collaboration with the Haverford Communications team, in 5 development Sprints, and launched on the Acquia Infrastructure. The Haverford Team really jumped in and took off with it. It was really great! You can read more about this project as LCM’s Acquia Certified Grand Master Developer, Jeff Landfried shares details of his experience here. Since then, Last Call Media has continued to work with Haverford on an ongoing basis as part of our dedicated Continuous Delivery relationship, where our dedicated team of developers helps to keep their site secure, up-to-date, and assists as needed with anything from strategy to design to development. The migration of Haverford to Drupal on Acquia remains one of our favorite projects to date, and it’s a great source of professional pride for all of us. We look forward to a long partnership with Haverford as we continuously evaluate how their online experience is meeting the needs of the College. An incentive-based healthy lifestyle program. 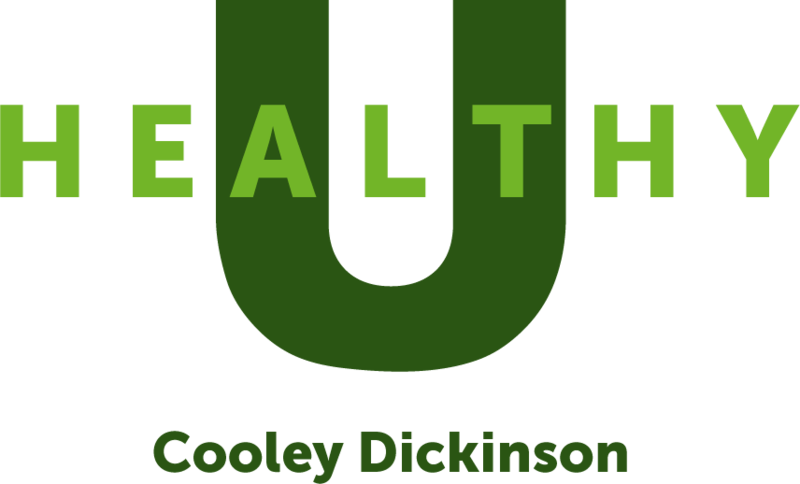 Cooley-Dickinson Hospital offers an incentive-based healthy lifestyle program to their employees. As employees participate in exercise activities, healthier eating habits, and education classes to learn life-enhancing techniques, they gain points— which translate to greater discounts to their benefits contributions. CDH was tracking this participation program on paper and in Excel for over 1000 employees. Last Call was hired to transform the program into an interactive digital experience to increase participation and automate much of the workflow of managing the program. We provided an easy-to-use interface to minimize the barrier of entry for users. 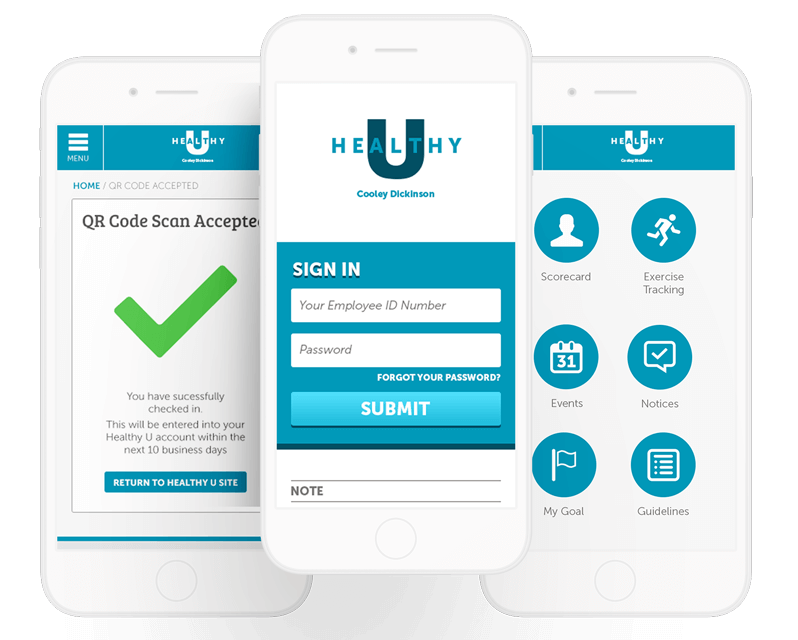 Maximized by a Mobile First approach, we condensed how much information was presented to allow users to quickly access the main features of the program, which included entering exercise activity. While also accessible through desktop and laptop computers, the primary use case for the app was on the go, from a mobile device, for a user to track their progress. LCM went further, implementing QR Code functionality, allowing CDH to post flyers notifying staff of special activities. Scanning the QR Codes on those notices would transition the user’s experience to the relevant area of the app. Things went really well with the program, it met all of our needs really well and the employees loved it. The program has been met with amazing reception both from administration, and employee participation. The program is being further expanded and developed to be modular and rapidly deployed at partner healthcare facility partners. Redesigning the College of Biological Sciences. Implementing fresh designs with improved pathways and navigation. Developing a digital media strategy with measurable results. 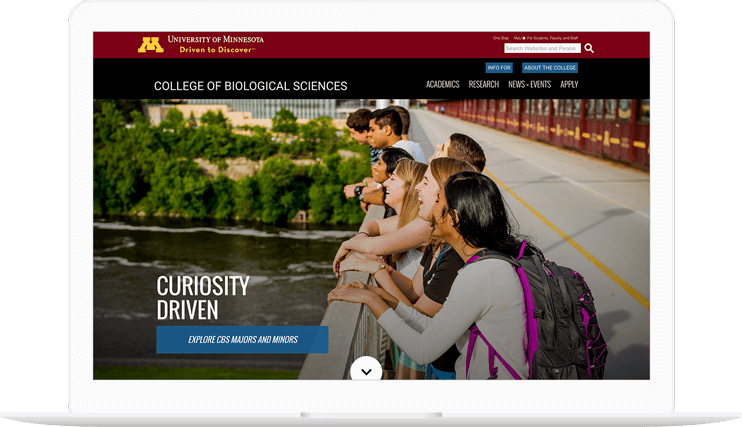 Challenged to increase enrollment, the College of Biological Sciences at the University of Minnesota looked to Last Call Media for ways to develop a digital media strategy with measurable results. Last Call Media focused on increasing engagement with CBS’ primary audiences— prospective and current students— by implementing fresh designs with improved pathways and navigation. LCM also coordinated the final migration and deployment of the site to the University’s Acquia platform. Working with CBS, we took the project from initial discovery and goal validation through information architecture, design, and development. We were able to deliver a compelling, modern, and effective site. With CBS’s target users in mind, Last Call Media improved site navigation and menu structure, re-working the existing navigation system to create a more fluid experience visiting the site. The site was launched in summer, in time to function as an active recruitment tool for the school year. After receiving consistent positive feedback, CBS and LCM received an award for the design and functionality. The CBS team has continued to add and manage new content on top of the sound foundation built by Last Call Media. A modern site home to the treasures of the world. A unique peer-reviewed publication and community. Aligning an aging website with modern organizational goals. 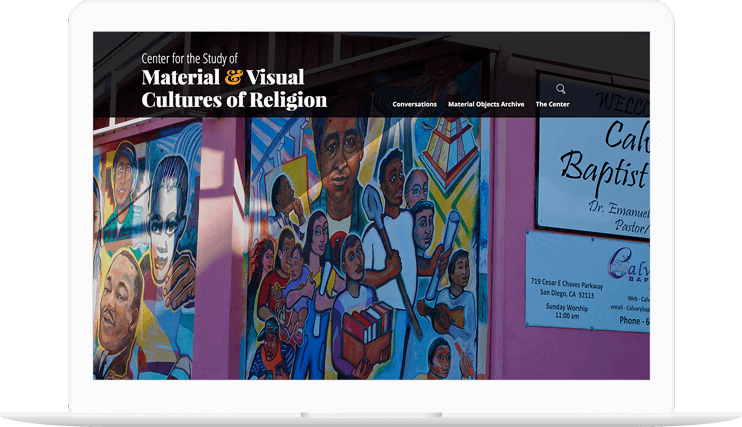 The Center of the Material and Visual Cultures of Religion (MAVCOR) at Yale University sought the expertise of LCM to help bring their aging website in line with their strategic organizational goals. As an online archive of objects of religion, often accompanied by narratives or conversations, the academic source was to behave like an online museum: delivering the user to the content in the most unobstructed way so they can focus on it. Much like a museum would, it’ll recommend related content for further exploration. MAVCOR is a unique peer-reviewed publication and community that gathers visual culture and hosts multidisciplinary collaborations of scholars from around the globe. This necessitates a virtual space that is the only one of its kind. Previously confined to the Yale departmental design template, MAVCOR came to us to design and develop a Drupal 7 site to enhance the functionality of their user experience, robust asset management, and spotlight their obvious visual culture. LCM partnered with the MAVCOR team to develop new and enhanced functionality to their Fellow’s Portal, Asset Management, Material Objects Archive, and Search in a visually-centric design honoring their unique and growing community. The new MAVCOR is a literal and virtual center of publicly accessible collaborative scholarship.